Starting from IBM Spectrum Protect (TSM) V 7.1.7, you can configure cloud-container storage pools on 4 of the popular and widely used cloud based object storage systems to backup the data. IBM supports the following cloud based object storage systems to configure storagepools and to take backup of the clients and to improve server performance, simplify storage management, and secure data by using encryption. You can use cloud container storagepools to store both the deduplicated data and non-deduplicated data and restore the data as required. However, before configuring the cloud container storage pool, you need to get the required account information details of the cloud environment which you want to use as the destination. If you want to configure cloud-container storage pools on Cleversafe, you must first set up a Cleversafe vault template and a Cleversafe user account, and then obtain the below configuration information. Cleversafe vaults are used in the same manner as containers in a cloud-container storage pool. Set up a Cleversafe vault template to quickly create vaults with your preferred settings. After you create a vault template, use the credentials from your Cleversafe user account to configure the storage pools in the Operations Center or with the DEFINE STGPOOL command. Tivoli Storage Manager uses the Simple Storage Service (S3) protocol to communicate with Cleversafe. If you want to use Amazon Simple Storage Service for cloud container storage pool, you must obtain information from Amazon that is required for the configuration process. Amazon S3 uses buckets to store data. Amazon S3 buckets are used in the same manner as containers in a cloud-container storage pool. Tivoli Storage Manager automatically creates a bucket in Amazon for an instance of Tivoli Storage Manager, and that bucket is shared by all pools for that instance. CLOUDURL: Specify the region endpoint URL that best fits your location, based on the Amazon AWS Regions and Endpoints page. Similarly if you want to use OpenStack Swift, you must obtain configuration information from the OpenStack Swift computer. Use the credentials from your OpenStack Swift account when you configure the storage pools by using the Operations Center or the DEFINE STGPOOL command. Similarly, if you use IBM SoftLayer, you must obtain configuration information from the SoftLayer Object Storage page. Use the credentials from your SoftLayer account when you configure the storage pool. Once you have the above required information, you can configure the cloud container storage pool by using both Operations Center and the command-line interface. However, the preferred way to define and configure a cloud-container storage pool is to use the Operations Center as it will be easier to configure and manage. Please watch the below video to understand how to do this. If you want to do it in a command line, use DEFINE STGPOOL command to configure cloud container storagepool in a cloud services platform. CLOUDType parameter specifies the type of cloud environment where you are configuring the storage pool. You can specify any one of the following values explained above. If you define a storage pool as using S3 with this parameter, you cannot later change the storage pool type by using the UPDATE STGPOOL command. If you do not specify the parameter, the default value SWIFT will be used. CLOUDUrl specifies the URL of the cloud environment where you are configuring the storage pool. 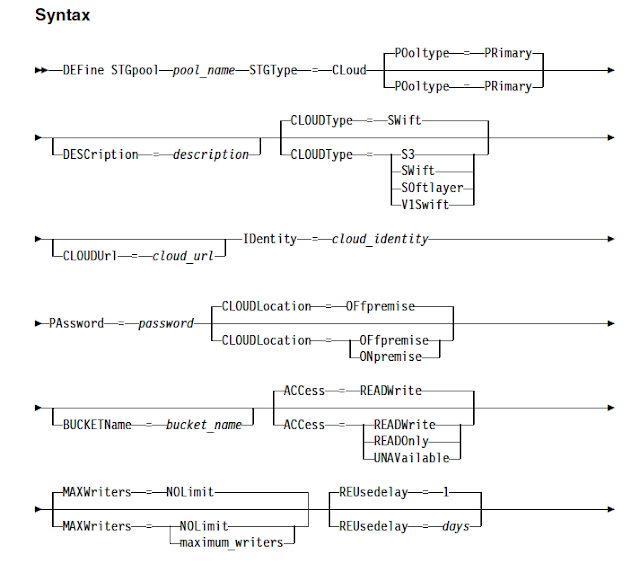 IDentity specifies the user ID for the cloud that is specified in the STGTYPE=CLOUD parameter. Based on your cloud provider, you can use an Access Key ID, a user name, a tenant name and user name, or a similar value for this parameter. PAssword specifies the password for the cloud that is specified in the STGType=CLoud parameter. Based on your cloud provider, you can use a Secret Access Key, an API Key, a password, or a similar value for this parameter. CLOUDLocation specifies the physical location of the cloud that is specified in the CLoud parameter. You can specify OFFPREMISE or ONPREMISE if you have your own cloud setup. The default value is OFFPREMISE. Please watch the below video to configure cloud container storagepool on Amazon S3 platform by using operations center. You can use the same steps for other cloud platforms as well. 0 Comment to "How to configure storage pool on a Cloud Storage services - Video tutorial"